There are exciting times for two of Bellingham's finest young golfers, Chris Killmer and Matt Rawitzer. Killmer, a 2010 graduate of the University of Washington and a three-time Bellingham Amateur champion, is making a name for himself on the Canadian Tour, while Rawitzer who graduated from Squalicum HS in 2009 recently decided to transfer from the University of Idaho to Oregon State University where he will team up once again with former Idaho coach Jon Reehoorn. BellinghamGolfer caught up with both players to check on their progress and what the rest of the year might have in store. After you won the Bellingham Amateur at Lake Padden last September, you told us you were thinking about setting up a cleaning business to help pay for your golf. Did that happen? So when exactly did you turn professional? The last time we saw you, you were helping out Steve Card with coaching duties at Western. I turned Professional in April when I entered the Canadian Tour Spring Q School at Desert Dunes in Palm Springs. The last event I was with the Western team was the Waikoloa Invitational in Hawaii, in January. I've kept in touch with the guys though and caught up with them before the GNAC Championship in Idaho and the NCAA Regionals in New Mexico. I know how disappointed they were to miss out on going to Nationals, but I'm very proud of them for the amount of work they put in. I think because I had finished my college career so recently I could really connect with the team. How did you do at Desert Dunes? I started out okay with a 72, but struggled a bit after that. In the end, I missed out on qualifying by three shots and left California very disappointed. But I managed to get a sponsor's invite to the Mexican PGA Championship in Mazatlan where I made the cut and finished tied for 49th (with rounds of 71, 74, 74, and 71). You tried qualifying for the Tour again? Yes, the Canadian Tour has three Q Schools a year - fall, winter and spring - so I played in the spring tournament in the last week of May at Morningstar GC in Parksville, BC. There I finished tied for ninth (74, 71, 75, 76) to earn non-exempt status (female golfer Izzy Beisiegel also finished tied ninth to become the first woman golfer in history to qualify for a men's professional golf tour). The exemption system is pretty complicated, but I made it into the Times Colonist Island Savings Open in Victoria, BC. where I played well (74, 67, 71, 69) and finished tied for 31st on one-over-par. Your status must have improved. Yes, I got into the Western Championship in Kamloops the week after the Times Colonist and shot four rounds in the 60s (68, 69, 67, 68) to tie for 11th. Now, because of my finishes in Mazatlan, Victoria, and Kamloops, I can play a full schedule on the Canadian Tour this year, including the Tour Championship. Given your recent performances, you must feel comfortable out there. I do, and I know I can compete on the Canadian Tour. I'm meeting a lot of great players and making a lot of new friends which I think is helping me to stay loose and relaxed, and play well as a result. It's great to be able to stay focused on your game but enjoy your time away from the course too. Sounds like you haven't been home a lot lately, and won't see much of Bellingham for the rest of the year. When you are home, where do you play and practice? I actually get out to a variety of courses. Most of the time I practice at Bellingham Golf & Country Club, but I also go to Lake Padden. Craig Welty at Skagit Golf & Country Club has also been great letting me come down on occasion. It was a lot of fun getting to know Craig this year while both of us were helping Coach Card at Western. Avalon has also been very gracious, and I got some great practice and fine-tuning done this winter at Joe's Professional Golf Lab. The stuff Joe has in there is amazing. I can go there and learn so much about my swing and equipment, and the video analysis is great. All of theses places helped me get ready for the season, and I am indebted to all of them. Mel Fish, Scott McBeath, and the rest of the staff do such a great job at Lake Padden. The course is always good, but they care enough to always try and make it better. Mike Montgomery, Rick Blankenburg, Connie Wrolson, and Shawn Krahling at Bellingham Golf & Country Club have been great. I have got to know them all very well this year having been there with the Western men's team almost everyday. The course is in top shape and looks more beautiful each week. Who could ask for a better place to work on one's game? It really is the place that has prepared me for the Canadian Tour this year. In fact, before my first professional event I was really struggling with my swing, but Mike really helped me out. He was out on the range at the same time I was one day and saw that I was having a hard time making good contact. He put me in a better position and I started hitting it really well. It was a simple thing, but Mike spotted it and I have been swinging the club more naturally and hitting the ball better ever since. Last question; on your blog, it says you listen to country music. You're a young man from the Seattle suburbs (sort of), so what are you doing listening to country music? I really love it; there's no better feeling than turning up some country music louder than it should be and having a good time. I really like listening to it in my car because I can sing as loud as I want and nobody has to be hurt by my less than stage-ready voice. The country playlist on my iPod changes all the time, but I always have 'BBQ Stain' by Tim McGraw, and 'Callin' Baton Rouge' by Garth Brooks. My favorite songs are the ones I know all the words to, because it gets hard to sing the songs if you dont know the words. At the moment, I'm listening to 'Dirt Road Anthem' by Jason Aldean. You recently made the decision to transfer from the University of Idaho to Oregon State University. Can you tell us why? It was an easy decision actually. Jon Reehoorn, who recruited me at Idaho was hired as the head coach at OSU last summer. It didn't really work out between me and his replacement, and I just really wanted to play for Coach Reehoorn again. Fortunately, he felt I could be an asset to the Oregon State team, so essentially I just followed him there. Tell us about your time at Idaho. It was both good and bad. My freshman year was great. I really enjoyed playing for Coach Reehoorn and with my teammates, and I enjoyed the school itself. My sophomore year wasn't so good though. Things changed quite a bit. With a new coach, personalities around you change and not necessarily for the better. Overall, I'd say my experience in Moscow was extremely valuable, but it came with some bumps in the road. 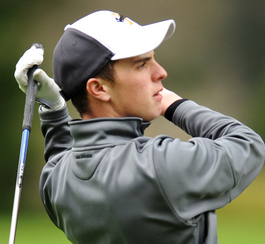 In your freshman year, you played 13 tournaments and recorded one top-ten with a scoring average of 74.63. In 2010-2011, you played eight times, had two top-tens (including a win at the Herb Wimberly in New Mexico) and averaged 72.39. So would you say you played to your potential at Idaho? Yes and no. Golf is unpreditable so it's not always easy to gauge one's potential. There are times when I played awesome and some when I felt I could have done much better. I have a pretty full schedule of tournaments. I'll play the Southwestern Amateur in El Paso, TX (tied for 12th on four-under 284), followed by the Washington State Amateur at McCormick Woods. I've accepted an invitation to the Sahalee Players Championship which is in the first week of July. 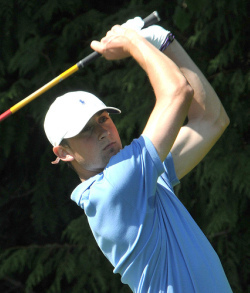 Then it's the Pacific Northwest Amateur in Bend, OR., and the Canadian National Amateur in Winnipeg in early August. There'll also be a US Amateur qualifier in there somewhere. When I'm not competing, I'll be practicing my short game at Bellingham Golf & Country Club which has very kindly allowed me to work on my game pretty much whenever I need to. I think I strike the ball as well as anyone, but I need to improve my chipping and putting if I am to do well this summer and then establish myself on the team at OSU. What about academics? What are you majoring in, and how important is completing your degree? My major is Business, and my degree is extremely important to me. I'm certainly not one of those players who just goes to college for the golf. Since golf is no sure thing as a career, I think it's essential to have a degree to fall back on.